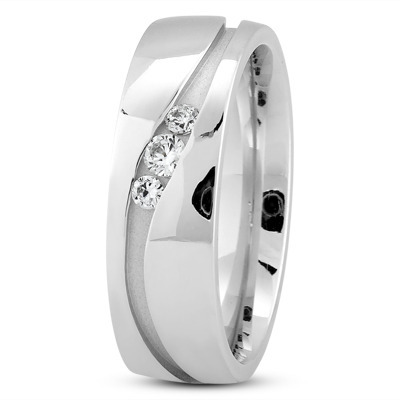 A modern unisex wedding 7mm band with three channel set round diamonds in platinum, also available in other sizes and metals. The price listed is for a ring sized 6, other sizes are also available, but please note that the price is subject to change. A modern unisex wedding 7mm band with three channel set round diamonds in 18 karat pink gold, also available in other sizes and metals. The price listed is for a ring sized 6, other sizes are also available, but please note that the price is subject to change. A modern unisex wedding 7mm band with three channel set round diamonds in 14 karat white gold, also available in other sizes and metals. The price listed is for a ring sized 6, other sizes are also available, but please note that the price is subject to change. A modern unisex wedding band 7mm with three channel set round diamonds in 18 karat yellow gold, also available in other sizes and metals. The price listed is for a ring sized 6, other sizes are also available, but please note that the price is subject to change.